Description: It is considered to be the most expensive spice in the world. This is done by cultivating the plant, but what is used as a spice is just their stigmas, which are actually three in number, but only one is precious, the other two are called "feminine" and have no taste or scent. Propagation of such plants is done by bulbs, as these plants don’t produce seeds. The best time to plant this flower is spring, and the suitable soil is clay or silica. To obtain 2 pounds of saffron you have to gather more than 150,000 flowers, growing on a surface up to 2 square miles. 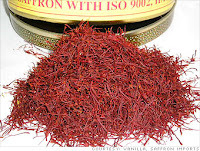 Obvious reasons for this spice to be so expensive, as the gram of saffron does not sell under 7 dollars. The aim of the business is to cultivate these flowers and harvest saffron for marketing. Conclusion: This sort of spice does not have any other substitute in the kitchen. It is a spice that would be successful, especially in luxury restaurants, recipes, high-end cuisin.